This posting will offer steps to help you in the event you find an adult stray cat or mother cat (after nursing kittens). The fact is you will come across a stray cat, many stray cats in your lifetime. The question is how to help the cat and your community. (Click here on what to do if you find kittens). First if it is a mother cat then it's absolutely critical to make plans to have her spayed. A female get can give birth four times in a year. And kittens as young as five months can get pregnant! They multiply fast! But be sure to wait until after the kittens are weaned from the mother. If the cat is friendly, then place the cat inside a pet carrier found at any pet store. DO NOT attempt to carry the in your arms or place her in box. She will escape. Ideally you want to take the cat to vet for checkup and have it spayed or neutered. In Miami there are many low-cost options. If you have pet cats, it's best to place stray cat in a separate room until they receive clean bill of health from the veterinarian. CLICK HERE to learn how to FIND HOMES for friendly stray cats. If the cat is shy or scared (not touchable; also called "feral"), then you will need a special trap. Here you have two options. Hire a professional to conduct the trapping, transporting, and post surgery care. In Miami the fee is around $70 per cat (which includes the surgery). There's work involved in having a cat spayed/neutered. These cages with adult cats inside can get heavy. After the surgery, the cat can NOT be released outside right away. Then there is the post surgery care. The females need to recover for 48 hours so they are not moving or running where the stitches can open (the incision is wider) and cause infection. Males only need 24 hours. Also if the cat is feral (scared, untouchable), then they definitely have to remain in the cage during the recovery. It's for their own protection and yours. This can be tricky and it helps if an expert shows you how. It's a matter of changing the newspaper, food and water. Our secret: slide the food and water, and newspaper under the side of trap with the angled closure using metal tongues (like those used for barbecues). Use shallow bowl for water and paper plate for moist and dry food. This way if the cat strikes out (in defense) they are not scratching your fingers or hands. Please remember the cats are scared. They are not used to being caged and around strange people. Please be patient. Thank you for taking the time to learn and help these innocent, homeless cats! You are the hero!!! CLICK HERE for information on what to do when you find kittens. We receive many of these calls especially now that it's kitten season. Most nonprofits are overwhelmed with rescue animals that they can not take in more cats or dogs. The solution is YOU! But don't worry, we offer information and tools to guide you through the process. It's three overall steps. 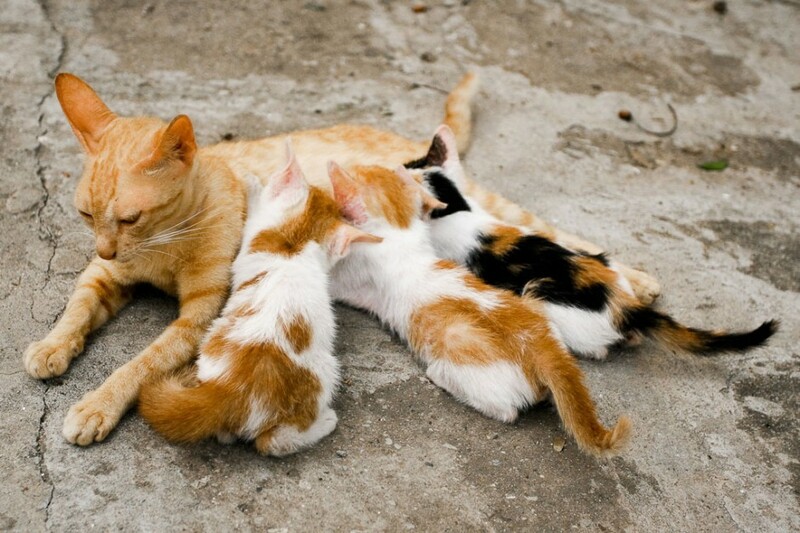 First, if you found kittens and a mother cat, try to observe if they are still nursing from the mother. If not, they are ready to be separated from the mother and taken inside so they can find permanent indoor home. Another sign is the color of their eyes. If they are blue, they are still young and likely to be under 6 weeks of age and should remain with the mother unless you are prepared to bottle feed. Once the eyes are no longer blue is a good indication they can be separated from the mother. However, if you find kittens and not the mother cat, it could be that the mother is searching for food. Do not remove the kittens right away. Please check regularly for the mother cat. She will need to be trapped and spayed immediately. When bringing in the kitten, if you have other pets, it's important to keep them in a separate room until they are bloodtested and vaccinated. This will also help minimize any allergic reactions for family members that suffer from allergies. Take the kittens to a local veterinarian to help determine the kitten's age, exact care needs or if any health problems exists. At this time the vet will perform a physical exam, a bloodtest and possibly administer vaccinations. If the kitten is at least 4 months old, it is critical to get it spayed/neutered but instead of spending $250+ at a vet, you can go to a low cost spay/neuter clinic for outdoor cats. Cats can get pregnant as young as four and five months. In Miami you have options. The Miami Dade Animal Services (MDAS), The Cat Network and Planned Pethood all offer low cost spay/neuter. At MDAS you have to make an appointment. With the Cat Network you must become a member for the year ($25) and then purchase a S/N certificate ($25) and take to participating veterinarian. Be sure to check their website to see if there is a vet near you. With Planned Pethood you must make an appointment. They are located off of I-95 and Opa Locka Blvd at shopping center just west of I-95. Very easy. If the kitten can eat and drink well on its own, he or she may only need routine care (a safe environment, kitten food, water, toys, bed, litter box--use non-clumping litter for kittens ). If the kitten is too small to eat and drink unassisted or does not have eyes open yet, then they are too small to be taken from the mother. But if you do not see the mother, do not immediately assume she abandoned them. Try to spend some time observing. Often she's searching for food. If the mother does not return, then do take in the kittens. You will have to act as a replacement mother. 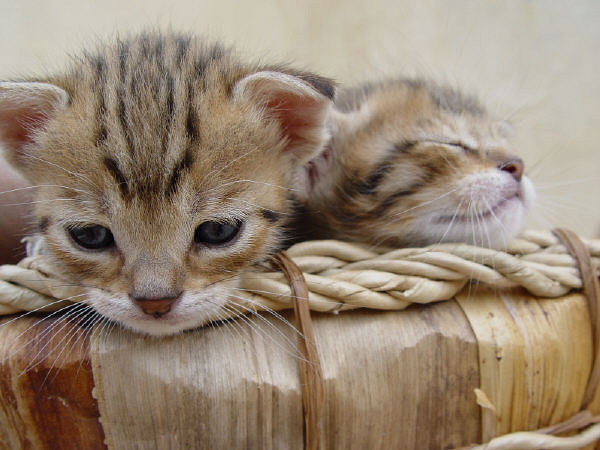 Extremely young kittens need to be fed kitten milk replacer according to the manufacturers' directions as often as every 2-4 hours, depending on age. NEVER give the kittens regular cow's milk. They are lactose intolerant so give any lactose-free milk at room temperature or goat's milk is the best. They may require a SAFE heat source such as a heating pad and an enclosed area like pet bed or box with blankets. If a heating pad is used, be sure to keep it very low and only use for half of the nest area or bed. This the kitten can move between warm bed or cooler spot in self regulating their body temperature. We recommend warm towels, no heating pad, if they are staying in a heated home during winter. Newborn kittens can not pass stool and urinate by themselves. They need gentle rubbing in the genital areas (with moist warm cotton balls or a very soft moist cloth) to help them pass bodily wastes. This should be done every time the kittens are fed. Any stool or urinate MUST be gently, but completely cleaned off the skin to avoid potentially severe skin rashes and even blistering from body wastes. What if you find the mother cat? CLICK HERE for help on what to do if you find a mother cat, or adult cat. CLICK HERE to learn how to find homes for kittens. Imagine that all of a sudden someone decides that you are going to have a roommate, a new person living in your home, without asking you. You have to share space, even the bathroom. This can be a difficult transition for humans and the same for cats. When introducing a new cat to your pet cat, there are a number of steps to follow carefully. To play it safe, the two cats should be able to smell and hear -- not see or touch-- each other. This will prevent that awkward first direct encounter. Place them in adjoining rooms with the door closed. Each cat should have their own water and food bowl, bed, scratching post and litter. Be sure to buy new ones for new cat so his new home environment is not overwhelmed with the scent of the other cat. You will gradually introduce their scent to each other. Feed the cats near the door that separates them so they gradually learn that coming together (even though they can't see eachother) results in a positive experience. After four days, switch their locations so they can familiarize themselves with the other's smell. This also allows the new cat to explore a new section of the home. Some behaviorists suggest rubbing the cats separately with the same towel to intermix their scents. First gently rub one cat with the towel. Then rub the other cat. After the towel carries both cats’ scents, bring the towel back to the first cat and rub her with it again. If the reaction is positive, then reward the cats with treats. This is important. Just like training a dog, you need to find a treat that they love. Something extra special. After 10 days, you can introduce the cats to eachother assuming there are no regular signs of hissing or aggression during their separation. This is the "look but don't touch" phase. Instead of a solid wood door, try to use a glass door or even better a screen door or two baby gates, (one on top of the other). Here the help of a friend is a good idea. Each person places the cat a few feet away from the separation gate. When the cats notice eachother, say their name and toss treats behind them, away from the gate. Over the next several days, continue feeding, playing and feeding treats near the gate and gradually getting closer to the gate. If all goes well above, then it's time to meet face to face. These introductions must be carefully supervised. Bring them together when they are calm, let's say after a meal or exhausting playtime. Some experts recommend a water bottle to use if one starts to misbehave. As the cats become more familiar with each other, allow them longer and longer periods of time together. If you have multiple pet cats, introduce the new cat one by one. Also cats are either bush dwellers or tree climbers. Make sure you know your cat and have sufficient cat or people furniture they are permitted to use for their own exercise and enjoyment. Otherwise pent up aggression occurs and is exhibited in disruptive behavior. Remember with negative behavior, such as peeing outside the litter box, the cat is communicating that something is wrong. It's either medical (please see a vet) or there is something uncomfortable in the cat's environment. Keep mental note of changes such as not cleaning the litter enough, did you move litter box or cat's favorite furniture? etc. Some cats will get along and play together and become bosom buddies. Others may not. It's important they at least respect one another. The key is consistency. Cats are trainable but consistency in the very beginning is critical. If for some reason you followed the steps and are having difficulty, there are expert cat trainers that can help you with more complex cat behaviors. Ensuring there is proper cat space, furniture, litter boxes (one per cat plus one extra), scratching posts, accessible water is important to ensuring a happy home environment for the cats and you. No one likes a sour puss. In reading and following the Loews Hotel disaster surrounding the outdoor cats that lived peacefully on expansive lush landscaped hotel grounds, I am beyond shocked that a major hotel chain with a brand slogan "Loews Loves Pets" would make a rash, senseless decision without expert advice. Where was common sense? If Loews Hotels has clearly mandated no cats on the property, then we know there will always be cats for various reasons. Let's review those reasons. 1. The Vacuum Effect. It's already happening. Unsterilized cats have already moved in. we know this from the trapping by Critter Control of three intact cats as documented on www.facebook.com/SaveLoewsCats. I just received the update today that security guards at Loews Hotels are seeing many more new cats on the property. We told you so. 2. The very close proximity of residential neighborhoods to the Loews properties. Some outdoor cats roam well beyond the perimeters of their home. What happens when Loews traps someone's outdoor pet cat? 3. Loews may think by stopping the feeding piles the cats will go away. The fact is it's human nature to feed a starving animal. There will ALWAYS be someone leaving food, whether it's an employee or hotel guest, it will happen. Realistically you can't put cameras in every nook and cranny of a property that size. Therefore, Loews Hotels will essentially be committing additional funds to trap and send cats to their death for eternity. A service that was provided for free to Loews for stabilizing the cat population, Loews Hotels is going to significant lengths and money to eliminate cats. Congratulations Loews--you just walked into your own trap! You are killing cats and your brand! Loews Hotels-- Orlando's official cat killers. 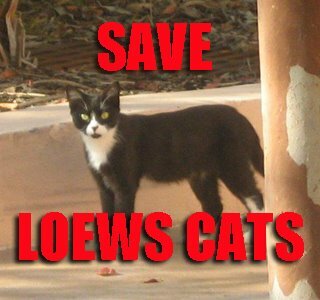 With the same amount of time and money and energy, Loews Hotels could have easily started a cat sanctuary right there on property! Where? Well if Loews is providing hotel rooms for the trappers, those hotel rooms could be joined and converted into an indoor sanctuary! Ok so instead of two hotel rooms make it three rooms to give them a little leg room. It's a five star hotel, give them some space. Or with the backing of a billion dollar holding company that deals with insurance, and oil rigs, pipeline transport and Mr. Tisch is co-owner of NY giants, certainly they could spare a million dollars a year to run a high occupancy cat sanctuary like the model one in Brazil or Naples, Florida. So I have to wonder if the Chairman, Mr. Tisch, and CEO, Paul Whetsell even know the details and exactly what's transpiring, other than their secretaries sending template responses "that forward your concerns to the Orlando team"? That's the problem, the Orlando team has not responded. Oh and did you see our Tweet appear on the megatron in Times Square? I was just thinking? Who's the CMO? Loews Hotels is taking a huge risk with their brand. No one at Loews Hotels has ever answered the following critical questions. How will Loews know if they trapped someone's pet cat? There's greater risk of domesticated dogs attacking another dog and hotel guests, it's happened many times, so why do they allow pets? What about the ducks!? There's greater risk of getting bitten by the ducks if you get close to them. There's greater risk of someone slipping and falling while getting out of the shower. Mr. Tisch should know, he's founder of the holding company that specializes in insurance. Animal lovers are a growing population in this country. We are not going to forget or let this go. CARE Feline is a small nonprofit organization and cannot bail out future cats trapped by Loews Hotels. That's why TNRM works! It controlled the population without overcrowding the shelters and sending cats to their death. (God bless Carol and Alejandra and other nameless CARE volunteers for your angelic efforts). The current Loews Hotel cats were like outdoor pets. You don't have to snuggle with a cat to be considered a pet. They have a name, a story, they knew the caretakers. The cats knew they were loved, until Loews Hotel betrayed them, ripped them from their home and made them suffer...oh my gosh, I still can't get over the number of injuries and the trauma they went through and still endure. While many have been relocated to new homes, they are still in the oversized cages. We can only pray when the day comes to open the cages and release them to the backyard that they will stay and not run away encountering...I shudder at the thought. Speaking of which, Bernie and Matrix have been released over a week ago and have not been seen. This is why rescue groups do not offer relocation as viable option. Sadly, instead of admitting their mistake and correcting it, Loews Hotel is quietly going forward. Critter Control is now wearing regular clothes instead of uniforms and driving Loews trucks. But the cats that remain still face a horrible, painful future called trapping and relocation. Seriously folks. There's so much more we can do and must do! Write your letters to the new CEO Paul Whetsell. Also, pick up the phone and call him. OK--you'll never get to speak to him directly but ask for him. And then give the assistant an earful! Be polite but have your concerns and questions ready, memorized, heartfelt...Leave your name and phone number or address. And Please sign the latest petition !!! For your Friday laugh to start the weekend...Check out this video of two cats playing Patty Cake! The originally video (without voiceover) reached 1 million hits, but since these guys added voices to the cats, it has over 13 million hits. Cats are just amazing. Why Won't Loews Hotel Tell the Truth? A concerned person wrote to the Loews Hotels and received this response. It offers no new information and Loews still has not answered critical questions to this day. We attempted to work directly with the local feral cat organization, and most recently with Alley Cat Allies, to re-locate the cats from our property. Unfortunately, they felt they could not support this change and would not assist in the process. Orange County Animal Services advised that their standard protocol is to turn ear-tipped cats that are brought into their shelter to the local feral cat group, for placement elsewhere. We chose this option. FACT: These organizations can not support relocation--a process that is clearly traumatizing to the cats with little success rates. In addition the methods of Critter Control have been inhumane. It's all documented on www.facebook.com/SaveLoewsCats. The outdoor cats were like barnyard pet cats in many ways. They knew their names, they had a story, they were familiar with caretakers. Loews Hotels accepts domesticated dogs without checking medical records including vaccinations. So why discriminate against harmless, vaccinated cats? Much of what I read in your letter is not based upon the realities of our situation. We are re-locating feral cats to the Orange County Animal Services Center and are working closely with the team there. Everything is being handled by licensed professionals. Orange County Animal Services has come on-site for a detailed review of everything we are doing and advised us that they had no concerns with our process. FACT: The animal shelter is aware that Loews has decided to trap their cats, but that is extent of the relationship. Loews is not doing the trapping. Loews is not delivering the cats to OCAS. Loews hired Critter Control to trap the cats and they are supposedly dropping off trapped cats at OCAS. Who is monitoring Critter Control? No one. Loews is not paying for the relocation efforts. Loews is not paying for the vet bills for injured cats. There are several cats unaccounted for. Where are they Loews? Where are they Critter Control? As I am sure you are aware, there are many who support positions contrary to TNR. Our hotels are pet-friendly, but there are important distinctions between owned pets and outdoor, free-roaming feral animals. The Florida Department of Health's position statement on this issue is clear and supports the concern we have for the health and safety of guests and team members. FACT: There is a distinction. The fact is domesticated "owned" dogs brought on property pose greater risk than do outdoor, managed, rabies-vaccinated cats. * Outdoor cats are naturally scared of strangers and run away as one approaches them. Loews knows this. There are documented incidents of dog attacks but Loews does not share this with the public. Loews does not check for medical and vaccination records of hotel pet guests. Loews does not call the veterinarian of hotel pet guest to verify if the records are updated and legitimate. The Loews outdoor cats were sterilized and rabies vaccinated. There is greater risk of hotel guest slipping in bathtub or anywhere on the hotel grounds. Loews has hotel guests with a pet sign a waver. Why not have everyone sign a waver recognizing that indoor and outdoor pets exist on property including ducks? Who is "I" mentioned in the letter? We are not giving up! We encourage supporters of the Loews cats to please take a moment to pick up the telephone and ask to speak to Paul Whetsell, the new CEO. You will probably never speak to him but do speak with his executive assistant. Be prepared to share your concerns with bullet points and questions. Please be polite. If you get voice mail, just leave your name and number. If you don't hear back, keep trying. For MEDIA INQUIRIES "Save Loews Cats"
*At Riverfront Cats we support pet-friendly hotels. However we can no longer support Loews Hotels. As stated repeatedly throughout these posts, there have been incidents of pet dogs attacking other dogs and guests at Loews hotels. We agree the hotel should not abandon their pet -friendly program because these "accidents" or tragedies (as in January 2012) are rare. However, the elimination of the Loews outdoor cats goes against their brand and increasing science that TNRM works. Unfortunately the Health Department of Florida is outdated. They have taken an old statement and added today's date. The Health Department has not provided any science that TNRM of feral cats poses a health risk to the community. Riverfront Cats was tracking the progress of the successful TNRM program at Loews Orlando Hotels. Upon concluding her case study, Christine sadly learned in December 2011, of Loews' decision to eliminate all the cats on the property. Many blog posts, articles and events have occurred. To help you track this case chronologically we list the relevant links from the beginning. The most recent postings are at the bottom. The Official Press Release by Save Loews Cats organizers summarizing events and the inhumane trapping by Critter Control. The photos speak volumes. On Earth Day, Christine is reminded of the sad plight of the Loews Hotel cats. She recalls the artwork throughout the Loews Portofino that features upscale residents with an outdoor cat. Thanks to the tremendous coordination by Care Feline TNR and kind-hearted residents, most cats have been relocated. We pray for their safe release. Note: By purchasing your pet's subscriptions through the link in upper right corner, Riverfront Cats receives a donation of 10% of your purchase.